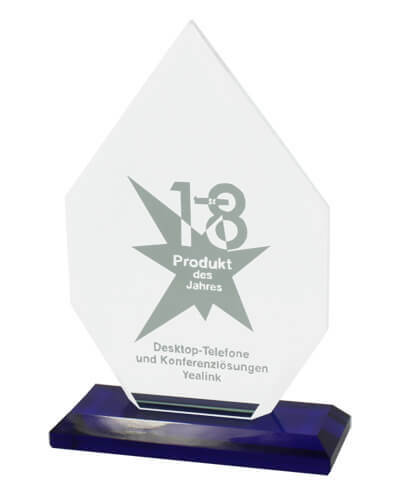 Xiamen, China - Sep. 24 2018 – Yealink, a global leading unified communications (UC) solution provider, is proud to announce its recent nomination for the Funkschau Reader’s Choice “ICT Products of the Year” Award. Funkschau is one of Germany’s top-selling professional journals. The Funkschau nomination is the result of a nine-week voting period during which 7,000 Funkschau readers chose nominees from almost 350 products in 24 categories. This is Yealink’s second consecutive annual nomination and comes on the heels of Yealink’s receipt of the prestigious Frost and Sullivan Best Practices Award 2018, which celebrates companies that inspire growth in their industries. “It is a true honor to be the recipient of these awards, which are a recognition of Yealink's effort and performance from different perspectives,” said Yealink Vice President Stone Lu. “The Frost & Sullivan award honors Yealink's general performance in the market while the Funkschau nomination recognizes market acceptance of Yealink’s solutions,” he added. "Yealink has always had a vision of connecting the world by making communication and collaboration easy and productive,” said Mr. Lu. “We consistently increase our investment in product innovation and we never stop improving our channel structure and partnership so that we can provide our customers better products and services. That's the secret of Yealink's success." Yealink follows an innovation-led approach backed by significant R&D investment to address customers' needs. The company offers a range of products covering different industries, business sizes and communication needs. Yealink's comprehensive IP phone product portfolio includes desktop IP phones, desktop video phones, conference phones and DECT wireless IP phones. Yealink remains focused on consolidating and expanding its presence as a leading unified communication terminal solution provider. The Yealink CP960-Wireless Microphone earned the Funkschau award in its category on the strength of its design and performance. The Yealink conference phones CP9XX series brings together quality, a pleasant user experience and affordability in a single product line, making it easier than ever to start a remote meeting on a Yealink conference phone. Premium audio quality is the foundation of Yealink's product development. Thanks to its ongoing audio technology engineering research and thousands of hours of product testing, Yealink continually refines and improve its HD voice performance. The innovative Yealink Noise Proof Technology provides support for the use of huddle rooms and ad-hoc meeting venues in cooperate offices. The Yealink Noise Proof Technology is an essential ingredient for the delivery of productive meeting services. The incorporation of Yealink Noise Proof Technology allows the Yealink conference phone to intelligently reduce background noises and foster a superior meeting environment. 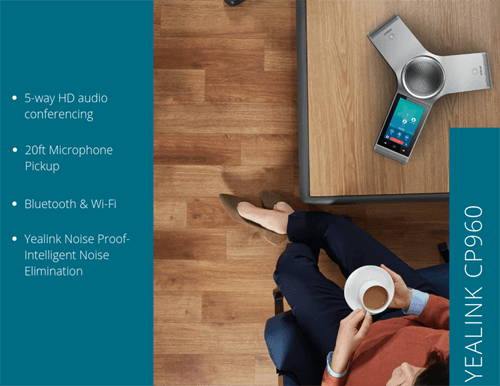 Notably, Yealink’s conference phones are equipped with a three-microphone array that supports a 20-foot (six-meter) voice pickup range, HD voice and full duplex audio. It guarantees the broadcast and delivery of exceptional HD-quality sound in both small and large meeting situations. The Yealink CP960-Wireless Microphone is ideal for large meetings thanks to its superior voice pickup and consistent delivery of HD-quality audio. The Yealink CPW90 is a practical and innovative accessory that increases the voice pickup range to 10 feet (three meters). Based on wireless DECT technology, it can easily be placed anywhere within the 20-meter signal reception range. During large training or lecture events, the presenter can carry the CPW90 and freely roam the event space. The CPW90 supports up to 19 hours of talk time. For wireless meetings in small huddle rooms and open spaces, the upcoming Yealink CP930W, a wireless DECT conference phone, is an ideal choice. The Yealink conference phones feature a Y-shaped metallic sliver body design that is stylish and professional while also making it more portable than ever. The CP960 incorporates a five-inch touch screen while the CP920 and the CP930W offer a touchable keypad interface, giving the user a familiar and comfortable experience while controlling and managing the conference. Moreover, the usage can be extended. The Yealink CP920 supports an analog PSTN telephony environment with the connection of the Yealink CPN10. Yealink conference phones can also be an ideal speakerphone by connect to the PC or mobile phone via Bluetooth or USB. All of the above benefits of the Yealink solution and conference phones are contributing factors that led to Yealink’s Funkschau Reader's Choice Award. For more information, visit Yealink’s product page. Stay tuned for our new conference phone release. Founded in 2001, Yealink (Stock Code: 300628) is a multinational corporation that dedicates itself to developing video, voice and content collaboration as well as communication technology. Yealink has transformed the market with their focus on high-productivity and easy collaboration. Currently, Yealink is providing services to customers in more than 140 countries. For more information, please visit: www.yealink.com.